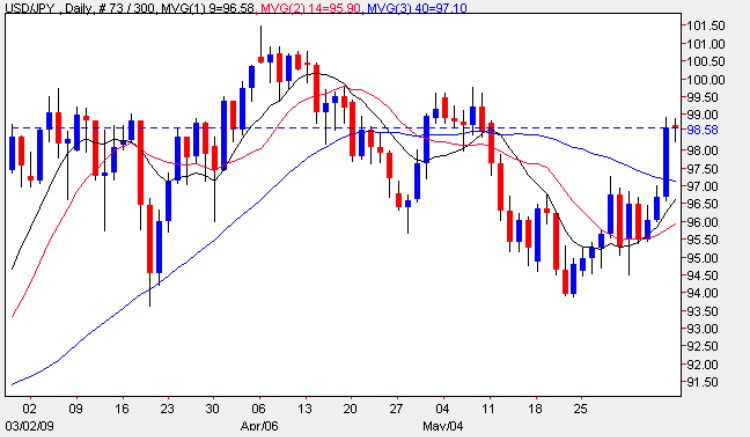 The yen to dollar currency pair continue in their own sweet way with Friday’s candle ending the session on a wide spread up bar, penetrating the 40 day moving average and breaking back into the head of shoulders of the last few months, and closing the week at 98.58. The move was largely prompted by the NFP data in the US which suggested that the downturn may be reaching the bottom as the scale of jobs being lost begins to slow, raising the possibility that the US economy may be about to turn a corner in the long slow road to recovery. From a technical perspective we are now firmly back in the congestion area once again, and until we see a clear break above this level, preferably with a clear move above the $102 price region, then I would suggest that you continue to stay out of this pair for the time being, despite the fact that we are now above all three moving averages. Over the next few months we are likely to see increasing volatility across all markets, and particularly in the currency markets as investors flip between the dual aspects of fear – fear about the current recession vs fear about a future of uncontrolled inflation fueled by an oversupply of money in the financial system and low interest rates. With no fundamental news in the US today, Japan kicked the week off with four minor releases, namely the Bank Lending, Current Account, M2 money stock and the wonderfully named, Economy Watchers Sentiment. Of these the last was possibly the most interesting as it showed that once again service sector sentiment had risen to a one year high in May, the fifth time in a row, coming in at 36.7 against a forecast of 34. The survey is based on key workers across a variety of service sectors and asks them to rate the current level of economic conditions, with a figure above 50 suggesting optimism and below pessimism.